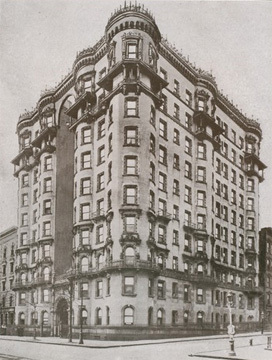 Early photograph from "The World's New York Apartment House Book"
Although the Upper West Side is best known for its fabulous multi-towered, Art Deco-style residential buildings, it is also well-known for an earlier generation of apartment buildings that were very decorative and almost whimsical. The Braender at 418 Central Park West falls into the latter category and while it is not as flamboyant as the Ansonia on Broadway at 73rd Street or the St. Urban a few blocks south on Central Park West, it is one of New York's few answers to some of the great residential buildings of Paris and Chicago. It was erected by Philip Braender in 1902 and was the subject of a fine "Streetscapes" column by Christopher Gray in The New York Times September 3, 2006 that was called "The Ungainly Duckling That Alighted Along the Park." The article noted that the building's architect, Frederick C. Browne, "was still working in the 'long hall' period of apartment design," adding that one apartment had "a corridor 60 feet long and 4 feet wide." "The exterior of the Braender - residents pronounce the name to rhyme with gander - is a complicated, even chaotic mix of French Renaissance, Spanish and Baroque styles, all in light-colored stone, brick and terra cotta. A pecular set of tile-roofed balconies at the ninth-floor level were long ago stripped of their red tiles and columns....The lobby was sumptuous, or at least showy. The 17-foot-wide courtyard off Central Park was ringed with box hedges and gravel paths, with a fountain set between stone benches. An iron and glass marquee - this was before the canvas canopy - sheltered the main entrance, which led into a vestibule with a square-coffered ceiling. This in turn led to the reception hall, paneled in highly figured white marble with gray-blue veining and set off by marble with swirls of gray and brown. This room also had a coffered ceiling, but in patterns of six-pointed stars." Mr. Gray noted that Montgomery Schuyler, a critic, observed in 1902 that the building's narrow light court plan was quite popular at the time but described it as hopelessly awkward because its walls were plain brick creating "a very grim and gloomy slot." "In the mid-1900s most of the large apartments in the Braender were cut up into smaller ones, and by the 1980s, when it was converted to condominiums, the building was in poor shape: its stone was battered and defaced, and the cornice and much of its ornament had been removed. The vestibule had been stripped, the striking ceiling in the reception hall covered or removed....On the outside, graffiti and paint are being removed, and masonry problems and leaks being repaired as part of a $1 million project headed by Dr. Perlman's wife, Judith. She explained recently that a series of six-foot-wide terra-cotta griffins supporting the balconies had been removed for safety reasons and would be replicated in fiberglass or a similar material." The building has a bicycle room, storage and a laundry. In an earlier column, Mr. Gray noted that "at the time the Braender was completed, there were perhaps a dozen very similar buildings on Central Park West, and in January 1902 the critic Mongtomery Schuyler wrote in The Architectural Record: 'One of these things makes you yawn. A mile of them gets on your nerves.'" Obviously Mr. Schuyler did not live long enough to watch the Monsters television show and did not realize that great cities need creepy, if not creaking, structures and that idiosyncracy and arbitrary dreams are the stuff of which architectural dreams are made.